The game is based in modern time within a zombie invaded land, when you sign up your character is created weak in a dangerous time. 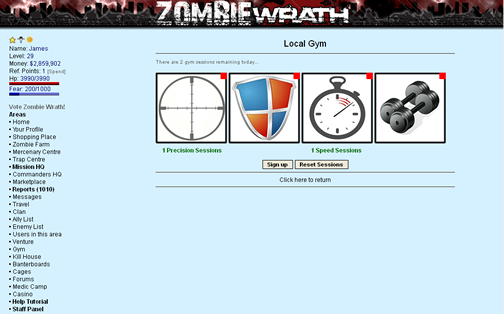 You must train up in the gym so you can defeat your enemies and defend yourself from zombies. 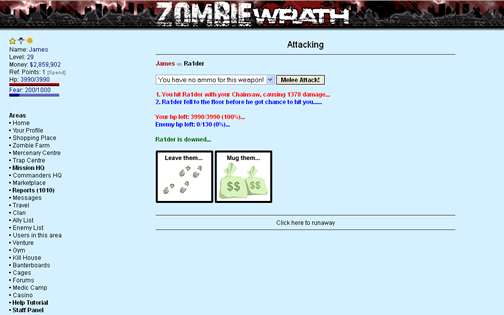 You can increase your level experience by attacking other players or by completing the many missions in Zombie Wrath. Weapons and armor can help you gain the upper hand on your fellow survivors. 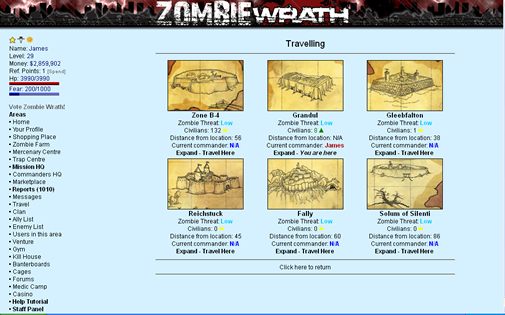 With six unique zones with loads of ways to travel between them, you can find your way around easily. From banking to safe zones, you will find your favourite zone your hub to your success. Plus with the opportunity to command one of the zones and ensure it's safety from incoming zombie hordes. 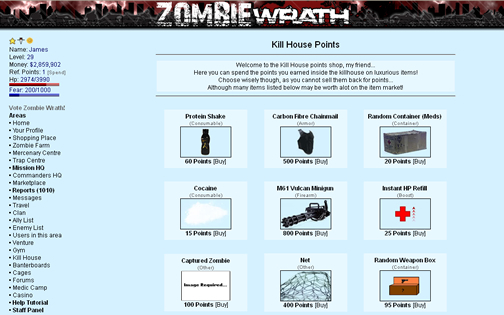 The Kill House is a good place to level up while earning some gear. 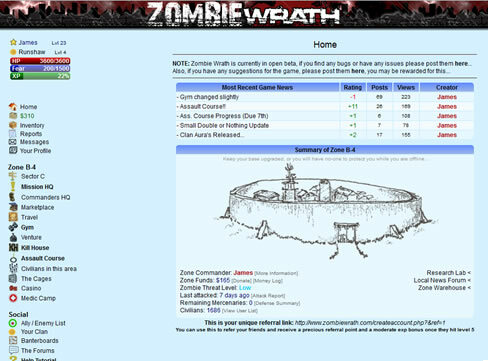 You are pushed straight into the deep end by entering the killhouse, you and three fellow players are pitted against wave after wave of enraged zombies focused on taking over the building. Your task is to hold them off, by succeeding you earn points which can be used to buy top range weaponry and useful consumables. Too weak to fend for yourself? Don't worry you can join a clan who may help you when in need. 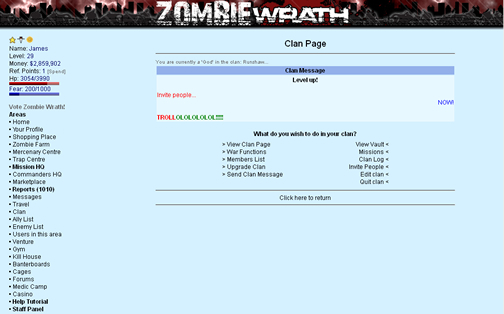 Earn your trust in your clan and rank up, maybe even become the clan leader and command your clan to war other clans. And if earning trust isn't your fortay then you can start your own clan as clan leader. Prefer not to fight other players? Well there are plenty of other features which you can use. The item market is a great place to earn your wealth which you can use to buy your way onto the leaderboards. The casino has many interactive games which you can enjoy, and maybe make your fortune. Liars Dice is a fun multiplayer game which is easy to learn but hard to master! Need to let off some steam? Got some suggestions for this game? Or maybe you'd just like to discuss non-related topics... 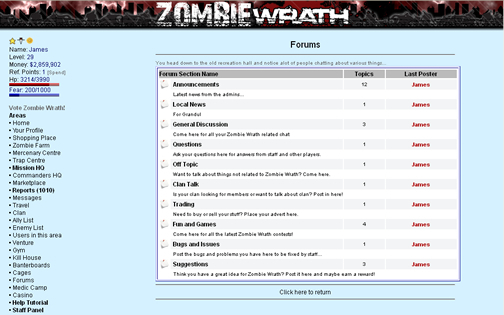 The Zombie Wrath forums are the place for you; Friendly, active and always a good place to share your opinion and maybe get a reply from the many useful staff members.